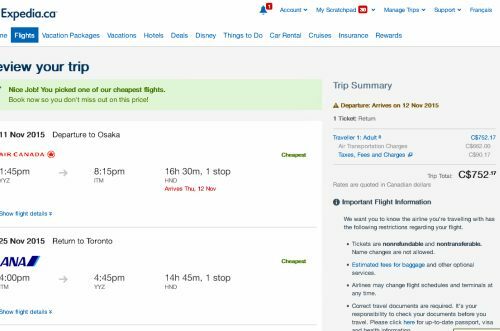 There are flights available from Toronto to Osaka (Kyoto), Japan for just $753 CAD roundtrip including taxes, using a combination of Air Canada and ANA. Note: These are just example date combinations. Other date combinations exist that will come up as $753. If you want to try other date combinations that are longer or shorter, start by focusing on midweek dates (such as Wed to Wed flights). To do this, start at Expedia.ca again, but click on 'Multiple Destinations' before searching. In the first set of boxes, search for a flight from Toronto (YYZ) to Osaka (All Airports). Use a departure date from the list above. In the second set of boxes (under 'Flight 2'), search for a flight from Tokyo (All Airports) to Toronto (YYZ) Use a return date from the list above. Where to stay in Osaka or Kyoto or Tokyo? 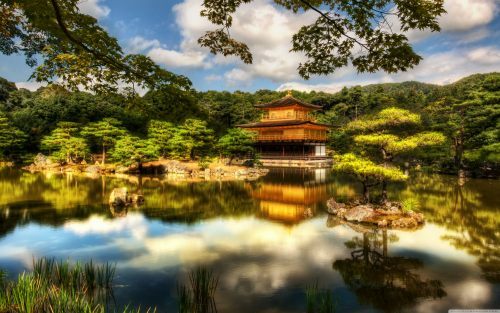 The following AirBNB link will lead you to some great deals on places to stay in Osaka or Kyoto or Tokyo for under $99 CAD/night for 2 people. toronto, yyz, flight deals, air canada, asia, tokyo, japan, nrt, east asia, osaka, kyoto, ana all nippon airways and itm.